【Temperature Humidity & Time Display】Habor digital hygrometer and thermometer is highly sensitive to update a fast and reliable reading within 10 seconds, which timely inform you of temperature, humidity and time. Easy operation to switchable between temperature humidity and time. 12 hour and 24 hour mode clock for choice, supports 12/24 time display. 【High Reliable & Accurate Readings】 Wide measuring range that measures indoor temperature from 14℉ to 122℉（-10℃-50℃), temperature accuracy range around ±1.8℉ ( ±1℃). humidity sensor measures humidity from 1Percent to 95Percent, humidity accuracy range around ±3Percent. A good choice for kitchen, garden, Greenhouse, basement, baby room, wine cellar, guitar room and office. 【Compact & Portable】 Digital monitor is small and light enough for saving space and carrying outdoors. You can take it anywhere you go. It is lightweight enough for easily fitting in your briefcase, purse, backpack or luggage. 【Multiple Mounting Options】 Great for monitoring Indoor humidity and temperature. Available for durable table standing, 45 Degree personality perspective design allows to watch in far distance. Wall Hanging allows to put anywhere you want. Strong magnet working Fine on the refrigerator. Do not worry about falling down. 【5 Comfort Level Indicator】 Screen display 5 comfort levels: blue for safe, green for attention, Yellow for Caution, Orange for Warning, red for danger. The corresponding level is marked by a black line. 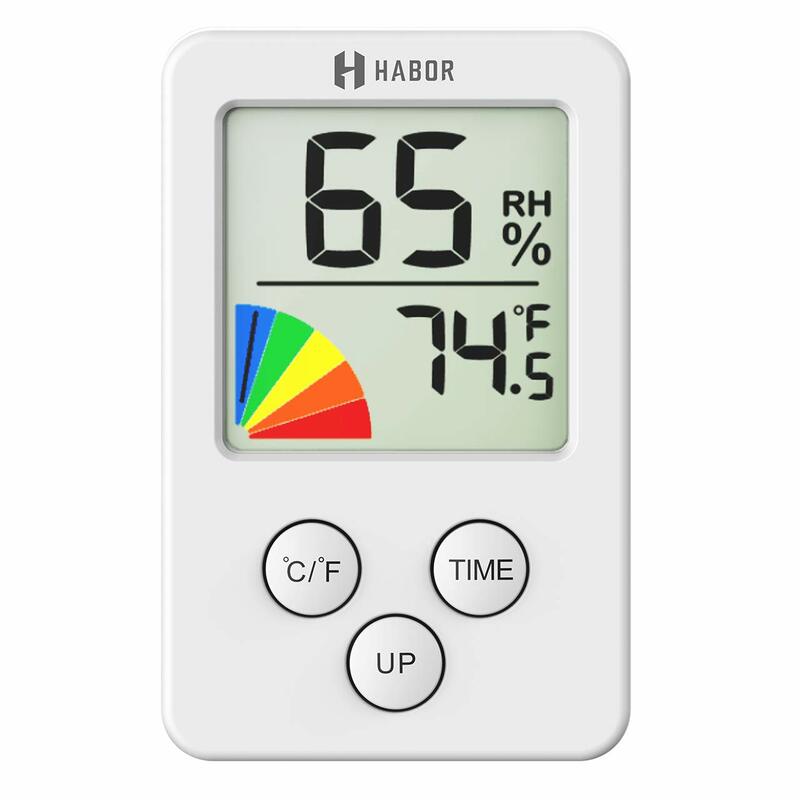 Harbor hygrometer Thermometer measures indoor humidity and indoor temperature In time help to adjust the humidifier, dehumidifier settings and humidity, great for monitoring family’s living conditions and health by preventing colds, dry skin, asthma, allergy, mold.